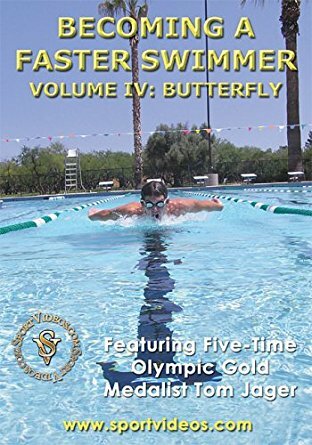 In this DVD, five-time Olympic Gold Medalist Tom Jager teaches a young swim team training tips and drills designed to develop a faster competitive butterfly stroke. The topics covered in this program include: undulation and developmental drills; streamlining, body and head position; kicking, recovery and breathing techniques; common errors and corrections, and more.The Special Features section provides additional tips and advice for swimmers,parents, and coaches. About the Coach: For nearly a decade, Tom Jager was the world record holder in the 50 Meter Freestyle. Tom competed in the 1984, 1988, and 1992 Olympic games, and earned five Gold Medals, one Silver Medal, and one Bronze Medal. Currently, Tom is the head coach for the women's swimming team at the University of Idaho. Swimming Instructional 4 DVD Set or Video Download - Free Shipping!